Who will be the Easter champion? Posted by Alicia Jaimes on April 11, 2019 in Lifestyles, Top Stories. 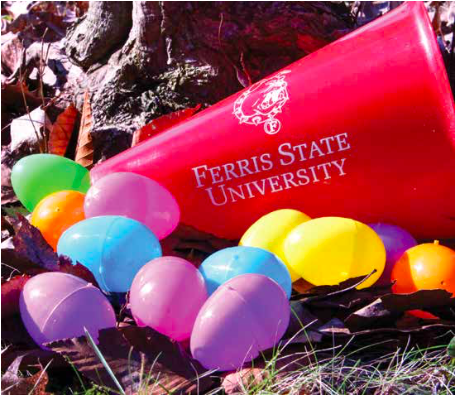 Ferris applied mathematics junior and Outdoor Club Vice President Ben Doyle hopes to reignite some childhood memories with hidden eggs and candy. Beginning Sunday, April 7, the Outdoor Club will be hosting its first annual campuswide Easter egg hunt. While many students may not remember the last time they went Easter egg hunting, Doyle joins an annual hunt with his family back home. Doyle and other Outdoor Club members hid between 200 and 300 plastic eggs around campus the night before the hunt began, and they hope many students will choose to participate in the fun. 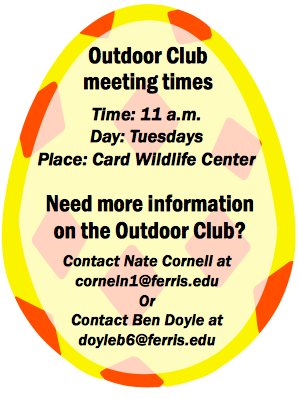 Each egg will have candy in them as well as a flyer with an invitation for students to bring the eggs to the Outdoor Club’s end-of-the-year Easter party 11 a.m. Tuesday, April 16, in the Card Wildlife Center. The student who finds the most eggs will win a prize, while the other students get to enjoy some free candy and be entered into a raffle drawing. Ferris biology senior and Outdoor Club member Nikki Beardsley is excited to provide a fun way for students to unwind from end-of-the-year study sessions and hopes students will get to know their organization a little better. “I hope to see our club get its name out there so people know who we are. We have so much fun doing outdoor stuff and I would love to see more people get involved,” Beardsley said. 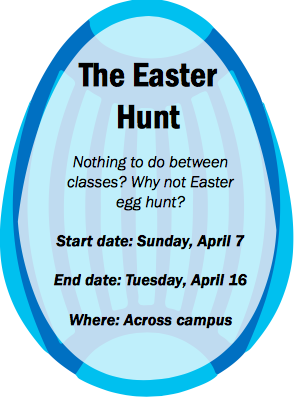 The campuswide Easter egg hunt ends Tuesday, April 16. “The best part about this event is that it gets students outside without putting them through rough weather conditions. Students might get turned off by hikes or camping trips if the weather is bad, but they have 10 days to search for the eggs, and it doesn’t take preparation to go searching for eggs,” Doyle said. For more information on the hunt, contact Doyle at doyleb6@nullferris.edu.